INOMUN is an English speaking Model United Nations conference organised by students from the International British Sections of the Lycée International Montebello (Lille) and Lycée Wallon (Valenciennes). The previous four editions took respectively place in March and in December 2015 in the Hôtel de Région in Lille, where we had the honour to welcome the delegates and their teachers. This would have never been possible without the support of the President de la Région, M. Daniel Percheron and both Lycée Wallon and Lycée International Montebello’s headmasters. We would also like to thank our dear teachers and the association GPSIBL. INOMUN est un Modèle des Nations Unies en anglais, organisé par des élèves des Sections Internationales Britanniques du Lycée International Montebello (Lille) et du Lycée Henri Wallon (Valenciennes). Les deux premières éditions se sont déroulées respectivement en mars et décembre 2015 à l'Hôtel de Région de Lille, où nous avons eu la chance d'accueillir les élèves et leur professeurs. Ceci n'aurait jamais pu être possible sans le soutien du Président de la Région, M. Daniel Percheron, ainsi que des proviseurs respectifs de nos deux lycées, Mme Corinne Delvallet et M. Thierry Claisse. Nous remercions également nos professeurs et l'association GPSIBL. We're students from International British Sections of Lycée Wallon in Valenciennes and Lycée International Montebello in Lille. 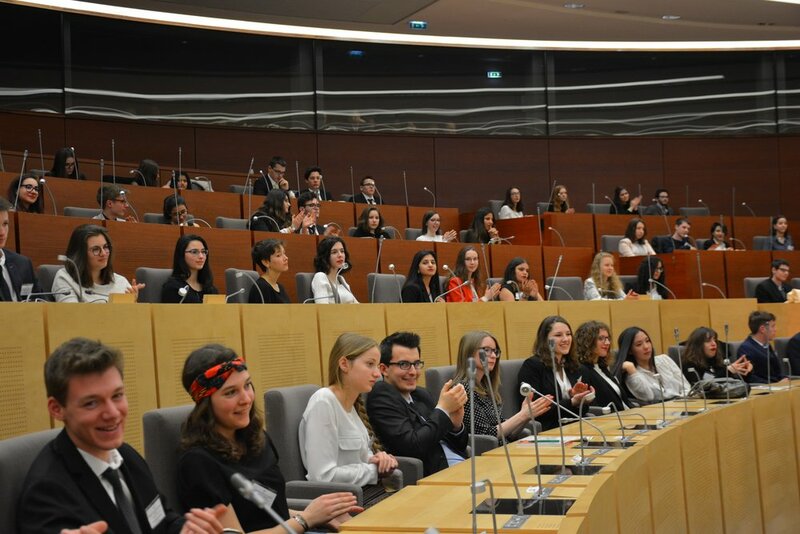 In 2013, students from Montebello went to ILYMUN, a MUN conference that took place in Lyon, and when they came back, they wanted to create their own conference, in the North of France. They opened a MUN club in September 2013 where students discussed various issues such as abortion, conflicts over natural resources, etc. In January 2014, these same students from Montebello came back to ILYMUN where they met some students from Wallon. Then the "MUN" movement spread, a MUN club opened in Wallon, and a 2 hours conference was organised in Montebello with 80 delegates for a crisis situation, the Ukrainian conflict. Montebello's MUNers contacted Lycée Wallon's students, and the INOMUN project was launched! Together they all started to think of a “Nord MUN”, later called INOMUN. In a month time, they managed to build up a team and get the support of their Proviseurs. The success of the First Edition in March 2015 allowed the next generation to taking INOMUN a step further at Winter Edition in December 2015. Ever since 2015, the project has passed from one to another generation making of this conference not only a tradition but an institution in our high schools. This year we celebrate the launching of the fifth edition and have never been more grateful to our seniors for making INOMUN happen. A MUN or Model United Nations is a simulation of the United Nations, commonly run by students and intended for them. They become ambassadors of a country (most of the time, a UN member) and are placed in different committees such as the Security Council or the Environmental Council. Each year, the Heads of Chairs decide on a general theme that is to be tackled during the conference, each committees focusing on a specific point of this theme. Aiming at resolving issues, the delegates debate, and find solutions, abiding by the rules of the United Nations. During the simulation, delegates debate the issue by submitting clauses (ideas to solve the issue), make speeches in order to find solutions to the real, important crisis they are dealing with. This experience leads them to set out strategies where they will create/make allies or rivals with whom they will engage negotiations to solve the conflicts. At the end of the committees’ debates a General Assembly is held with a new issue where everyone is gathered to propose clauses to all the other delegates. Model UNs began for the first time in Harvard in 1951, and now the concept has been taken up by a lot of prestigious schools and secondary schools such as Sciences Po (Paris) or the University of Peking. MUN clubs opened in middle school, high school and college/university, and help pupils to prepare for MUN conférences. What could inomun teach you? First and foremost, INOMUN is an international conference where a good mastering of English is essential. It is indeed a three day long debate where different people from different backgrounds will meet each other. By participating in this project, you will not only improve your English but also meet international people and make new acquaintances. Debating in INOMUN is a way to better understand sociopolitical issues in the world (such as Oil or Social Inequalities). By taking the floor, you will become an actor in the « grown-up world » to defend your country's point of view and to bring a positive change in the world. INOMUN is also a way to build self confidence and to prepare yourself for the hard job of being an adult by becoming aware just how difficult it is to get decisions made.Moreover, this kind of experience will always be an improvement for your higher studies. This MUN conference is unique in the way it is open to European sections insofar as they speak English well enough not to be discouraged by a challenge or feel out of their depth in a debate in English.